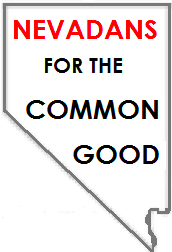 Las Vegas, NV - Leaders of Nevadans for the Common Good cried 'foul' when a dead bill proposing to privatize the provision of Medicaid services was kept alive through unnatural means. Though voted down, it remained in the Assembly Ways and Means Committee through an exemption sparing it from normal deadlines. That same language was then grafted onto a separate bill (SB 514) and approved by the legislature the day before it adjourned. "We are just concerned about transparency," said Barbara Paulsen, whose church in Boulder City is a member of NCG. The proposed change could impact 54,000 people statewide. ""If there's a transition, it needs to be carefully planned," Paulsen said Wednesday. "It's a major decision and people need to be aware of it and need to have an understanding of the steps being taken and the rationale and ability to comment on them." Section 37 of the bill enables the state to consider the possibility of privatizing long-term care and services provided to the blind, elderly and disabled -- but only after submitting a an analysis of fiscal impact. Leaders argue that there should be an analysis of the impact on the people receiving those services as well.